A few members are showing an interest in creating replicas from around the world, I created this gallery to show them off in one post. Mr Hertzian Cone's magnificent Danish Type V dagger made from plate glass. Mjflinty's Beaker Style point made from Grand-Pressigny flint from France. 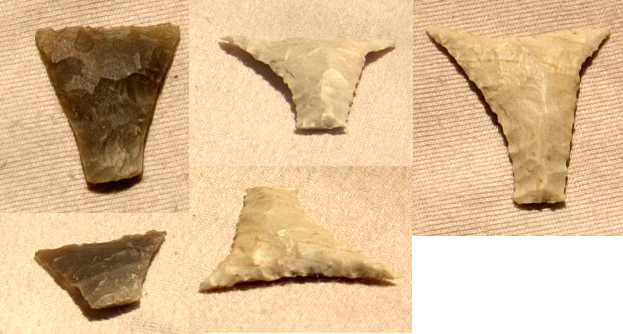 After the last two here's my more humble attempts, some Neolithic Oblique Arrowheads. I found some pics of authentic ones on finds.com and decided to have a go at reproducing them. The first two were practice runs, never attempting to be exact copies just loosely based. The 3rd point was my first serious attempt and an attempt at an exact copy of no4, but broke in the cutting down process, so I turn it into a copy of no3. The 4th point was an attempt at a copy of no4 also but I halted the trimming process where it is now as I thought it looked a slightly better shape than the original. 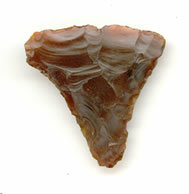 how about a nice clovis point? Or maybe another? These where made last summer from Norfolk flint. The other clovis points where fun to make, so I made a big one in glass! The fluting flakes at the base where worrying to drive off freehand, the last thing I wanted to do was break it. I think it turned out ok. Some lovely pieces there. 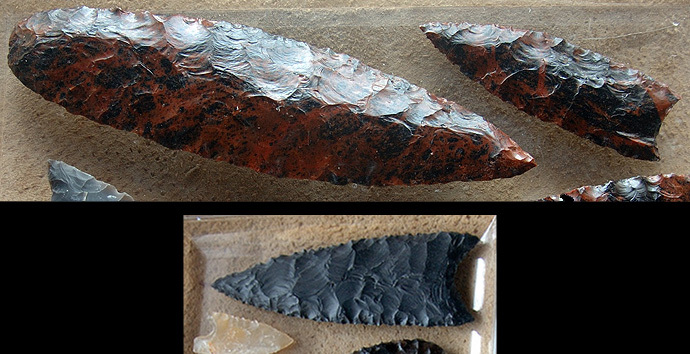 How do you take off the flake from the bottom on the clovis points? I've seen several 'contraptions' on youtube to get that final 'trough'. That sure is nice fluting, you could turn it into a Folsom if ever you get bored with Clovis. I've tried fluting a few times, either broke the piece or hit it too soft through fear of breaking it. Here's some of my old Clovis, the big one's almost a foot long and both the obsidian points are 100% percussion. Here's one I did last night, it's a Conygar Hill type British Barbed and Tanged. The one on the right is an original. Fluting! That was the word I was searching for last night. 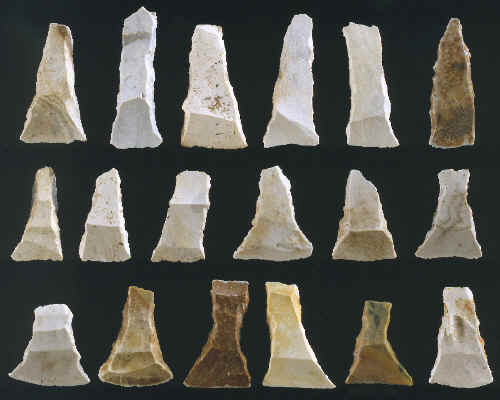 The flint clovis points where fluted using a jig, the glass one the flutes where bopped in! This is one of the Beaker daggers I've made. [img] [/img]and this was what I started with to make the dagger. Never fails to amaze me at how much flint has to be removed to get to the shape you want. 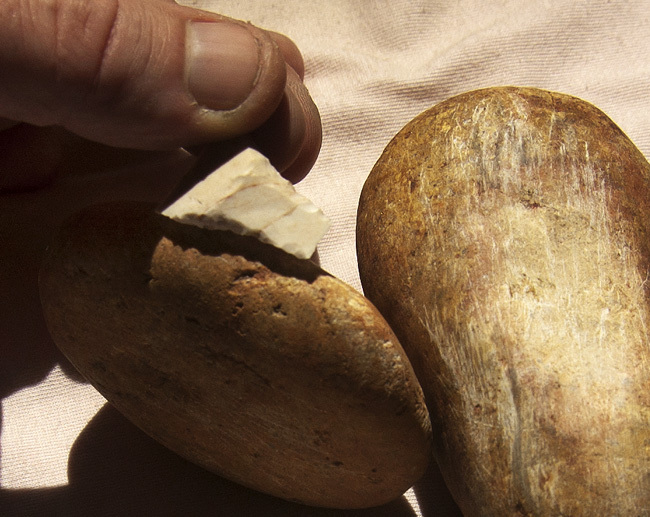 As to the dagger being a bit 'rotund', better that than knapping it down to shards. It's a lovely piece of work, and more importantly, fit for purpose. 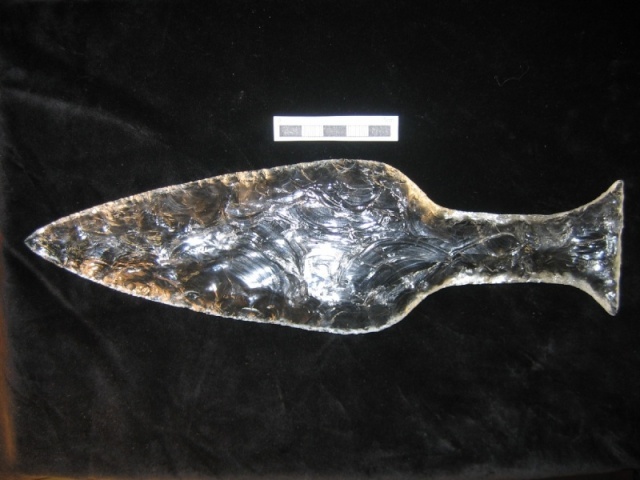 As to the dagger being a bit 'rotund', better that than knapping it down to shards. The amount of perfectly decent bifaces I've broken by kneeling at the alter of the cult of the ridiculously thin. No doubt our ancestors would roll their collective eyes and give us a mega 'tut' if they saw the amount of flint we waste. talking of art knapping, this is the mother of all clovis points! I think this one is slightly larger than 12" long. I will post more of the flinty stuff soon. Glass may not be authentic, but at least it's stable and fairly predictable. It certainly lets you really work on detail, without worrying about coming across flaws and fractures. And it really looks good. 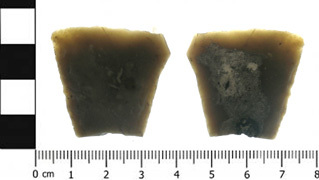 Here's some really old style points dating from the early neolithic and late mesolithic microlith industries and found widely afield including the UK. Chisel points defy the convention that we've all grown up with, arrows get thinner at the tip, they get wider. Most chisel points were very crude and had most of the original flake scar left on them, though a few were very fine prestige points. Here's a my attempt at a crude one and a prestige one. 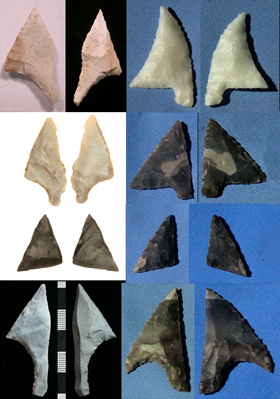 An even more common form of the point was the Transverse Chisel Point, Transverse points were knapped with the bulb of percussion perpendicular to one side of them rather than the more common, point facing the bulb. and made these replicas. the very first one I made broke as I was pressure flaking it to create the inner curve, not surprisingly I guess as fractures naturally follow ridges. So for the next attempts I found and anvil stone with a curve and put the curve in as I shearing. A Brandon knapper could produc 3-4,000 flints per day, I guess something approaching this would be possible for an experience Transverse Point maker, if indeed this was the technique used. this is another large barbed and tanged point, made from a "spall" and thinned down, there is one this size on display in the first farmers gallery at Gressenhall museum in norfolk. [img] [/img]and this is the other side showing the large cruddy patch that took some determination to work!